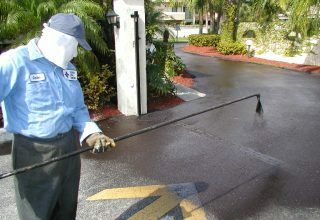 Sealcoating is a process that is necessary for all paved surfaces. Not only does sealcoat make asphalt more attractive, but it also protects the surface from weathering that may be caused by exposure to automotive chemicals, UV rays, and acid rain. Prolonged exposure to these elements may cause premature aging of asphalt and eventually require potentially expensive replacement. Sealcoat can be applied as a DIY job; however, business clients should be especially careful and follow SAE guidelines. Failure to use SAE may expose businesses to liability in the event that their asphalt surface is unsafe or causes damage to the property of others who may use the paved area. Most sealcoatings are made of a formula that is based on refined coal tar, a very stable chemical that consists of closed ring-Aromatic compounds. Because these compounds are stable, they are able to withstand intensive weathering. Asphalt emulsion is a second type of sealcoating that has become increasingly accepted as it has a lower odor and causes less skin irritation than refined coal tar. While asphalt emulsion does resist the appearance of cracks, it is not as resistant to gasoline, fats, and oils. The type of preparation that is required prior to sealing asphalt will depend on the age and condition of the pavement. Because sealcoating’s performance is directly dependent on pavement condition, the first goal is to ensure that the pavement is intact and suitable for sealing. New asphalt must cure for 90 days at a temperature of 70 degrees or more prior to being sealed. Older, oxidized asphalt may require priming if its surface is powdery. Moreover, the pavement must be cleaned with brooms, brushes, and a pressure washer if necessary to eliminate debris and stains. If cracks are present, they should also be filled with a liquid filler or patching product to improve the integrity of the surface.